Judges in the United States regularly (and often harshly) are disciplined for “bad” criminal law decisions. On a number of levels, it is baffling that this ethical “Rule” — punishing judges for errors of adjudication — has never been the subject of in-depth critical analysis. Thus, this Article is surprisingly the first scholarly work fully deconstructing the Rule (along with attendant considerations in criminal law adjudication) and addressing directly many of the tough questions that have been avoided or mistreated. This Article begins by examining an unexamined, “yet earthshaking” movement—that is, the modern invention of using judicial conduct commissions (“judge prosecutors”) to police violations of criminal defendants’ legal rights. The Article goes on to justify the movement in the context of the high stakes of criminal adjudication. It ends by arguing several important implications and practical consequences of the movement on the conduct of judges, attorneys, and the criminal justice system. Along the way, I redefine the Rule in a manner that cleanses the sloppy and self-defeating elements of the Rule that have collected over the last thirty-plus years of case law, and I confront the most fundamental objection to the Rule — the rhetoric of judicial independence — using the objection and ethical theory to discern the Rule’s legitimate limits, the most important of which is protecting adjudications that avert significant injustice. Finally, the Article concludes by assessing the ABA’s revisions of the Rule in February of last year (through the new Model Code of Judicial Conduct), and it suggests that state supreme courts should adopt the ABA’s proposed revisions only after substantial modification. 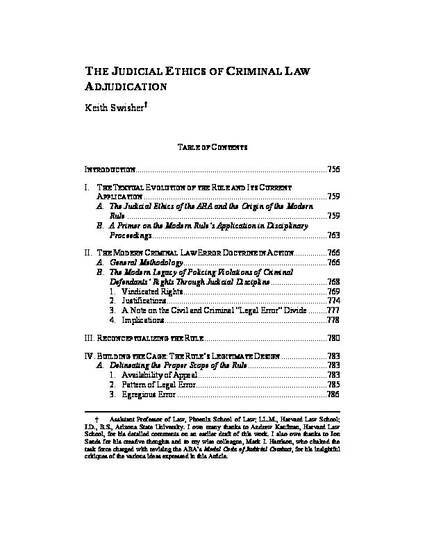 Keith Swisher, The Judicial Ethics of Criminal Law Adjudication, 41 Ariz. St. L.J. 755 (2009).